You probably know that Emeril Lagasse can cook, but can he design cookware? As it turns out, yes! Lagasse works with experts at All-Clad and offers cookware in multiple formats. From stainless steel cookware to nonstick to a hearty cast iron skillet, Lagasse and All-Clad offer useful, durable cookware that should survive the test of time. Your investment in cookware by Emeril Lagasse will also help his organization give back to communities. Lagasse leads a foundation built to increase access to education for low-income children. His organization helps to encourage and train young people in the culinary arts as a career path to lead them and their families out of poverty and into a new future. If you ever watch his cooking show, you know that Emeril is a high-energy guy who loves roux, beer and cooking with garlic. However, he's not a cook who wants to do a lot of updating. Yes, he has new kitchen gadgets available on a regular basis, but his basic cookware suggestions such as cooking pots don't need regular upgrades. 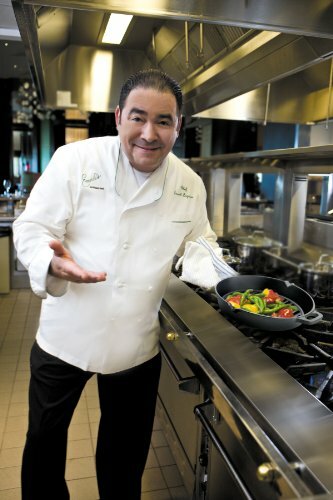 Emeril Lagasse cookware is available in multiple formats. You can purchase everything from full sets of stainless to just the right skillet. Many pieces come with tempered glass lids (so you can keep an eye on things) and are more than pretty pieces for the kitchen; they're built to work. There are a lot of celebrity chefs promoting their latest color or style of cookware, and it's absolutely crucial for cooks to have a kitchen stocked with items they enjoy using. However, it's easy to get into constant replacement mode when the latest products come out, and that's expensive. Thanks to The Emerilware™ Lifetime Warranty, replacements for damage under normal use, you can invest in Emeril pots and pans and potentially use them for years. Emerilware is made in China, All-Clad is made in the United States. It should be noted that those who purchase Emeril's All-Clad products will enjoy the same warranty and customer service as those who purchase from the American made All-Clad product line. Emeril's All-Clad cookware set is generally lower in price than a standard stainless All-Clad set. Of course, sales vary, and it's always important to watch for a bargain, but if you choose to avoid the Lagasse products and purchase an American made set, be prepared for a larger investment. 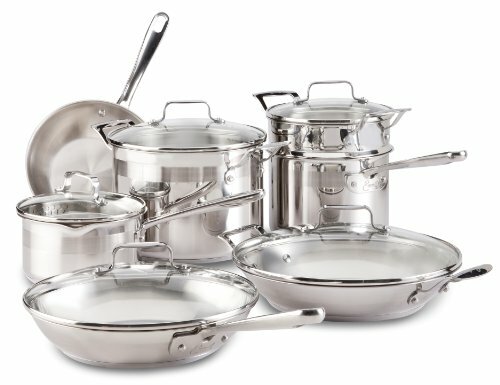 The Emeril 12 piece All-Clad set us just under 25 pounds, thanks to its aluminum core and thinner sides. A copper core, 10 piece set from All-Clad weighs in at more than 28 pounds. If you love stainless steel cookware but just can't handle the weight of All-Clad, consider the Emeril set. The Emeril All-Clad Cookware Stainless Steel set is built to last for years. This heavy-duty cookware is made of 18/10 stainless steel with an aluminum insert for excellent heat transference. It should be noted that while there is aluminum contained in these pots, but it never touches your food. In classic All-Clad fashion, these stainless steel pots are hand polished and will display beautifully. The lids are tempered glass with a stainless rim. The cookware is oven safe to 350 degrees Fahrenheit / 177 degrees Celsius. All of the pieces are dishwasher safe. Like all stainless steel cookware, these pans are not coated with nonstick material. However, if you should burn something onto the surface of the stainless, it can be cleaned up with a mild abrasive such as Barkeeper's Friend. 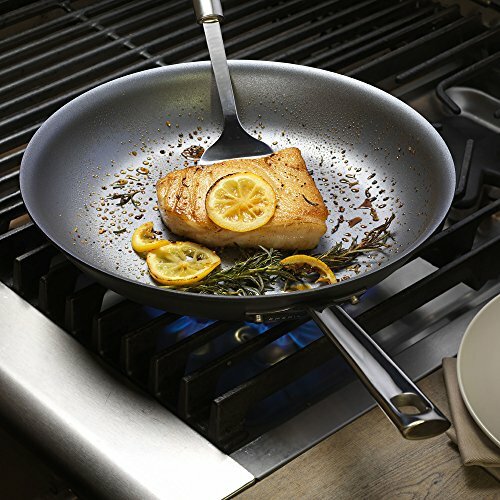 Your Emeril by All-Clad cookware also features a flared handle design well-suited to a hard-working kitchen. Even large hands will fit inside the handles of this cookware, making it easy to move pots and lids around without burning your knuckles against hot glass or steel. This Emeril stainless steel cookware set also features helpful measuring marks inside each of the pots, so as you add the basics for sauces or just need to bring something to a boil, you can be certain of how much liquid is in that pot and adjust your recipe accordingly! 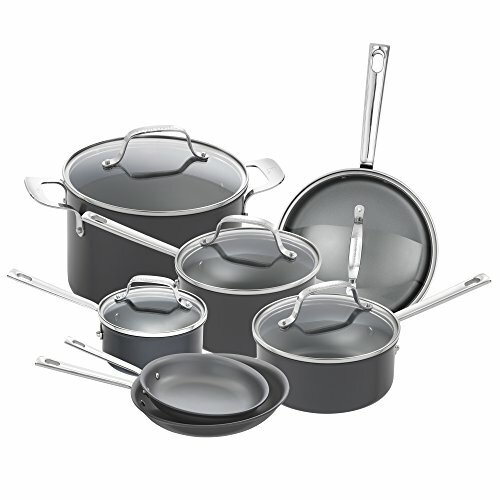 The Emeril All-Clad set is built with the same quality found in other All-Clad cookware. Many users find that this set is lighter and easier to work with than older All-Clad sets, so if you struggle to handle the weight of cookware, this set might be an excellent option to consider. The hard anodized non-stick set by Emeril is a great collection of cookware for your kitchen. The lids are tempered glass and offer plenty of clearance between handle and glass, giving you room to grab with less risk of burns. The flared handles on the stock pot also offer plenty of space. 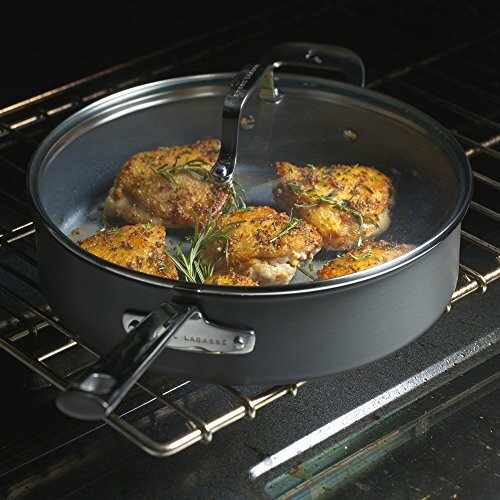 There are three layers of non-stick coating on these aluminum pans for easy release and clean up. The handles are stainless so these pans can go from cooktop to oven and will handle up to 350 degrees Fahrenheit / 177 degrees Celsius. All handles are affixed with sturdy rivets and will hold up well. This set features two frying pans, three saucepans with lids, a five quart saute pan with a lid and a large stock pot. The saute pan also offers a helping handle across from the long handle for moving this pan from cooktop to stove or from stove to table. One of the best things you can do for any nonstick cookware is to allow it to cool before washing. Even hard anodized pans will flex when exposed to extremes in temperature, and this flexing will cause the nonstick coating to flake away. Wash gently with soap and water once the pan has cooled. The Emeril Lagasse nonstick set is understated and can display beautifully. The top and bottom of the pans are a deep gray, so hang them anywhere within easy reach of your cooktop and enjoy durable elegance every time you cook. Experts say that well-seasoned cast iron can last a lifetime and this pan is a great start to your collection. The Emeril cast iron frying pan comes pre-seasoned with detailed instructions on how to protect and enhance the seasoning. When properly seasoned and maintained, cast iron will release fried items instead of clinging to them. To protect your cast iron cookware, it's best to avoid cooking anything acidic such as a tomato sauce. Instead, use your cast iron for foods that need consistent heat. Grilled foods, from steak to asparagus, will cook up well in your cast iron skillet. This product is extremely heat tolerant. Cast iron, properly seasoned, can handle temperatures of up to 600 degrees Fahrenheit / 315 degrees Celsius. Once it's hot, it stays hot so handle with respect! The Emeril frying pan has a long handle that is aided by a helper handle on the other side for easy movement of food from cooktop to oven. There's a flare on either side of the pan for moving food from pan to plate. 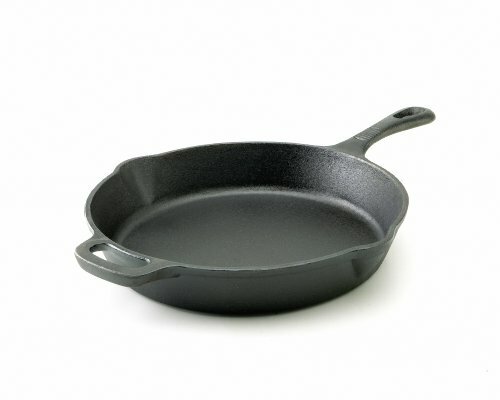 You'll find detailed care instructions included with the Emeril Cast Iron pan. Follow them, keep it seasoned, and this may become an heirloom piece. Emeril cookware is manufactured by All-Clad and comes with a lifetime warranty. The Emeril Frying Pan comes with a lifetime warranty, and some users have suffered everything from warping to cracks and gotten a new pan, no questions asked. Fans of the nonstick cookware have also found that the warranty for Emeril cookware is excellent. The stainless set also includes a lifetime warranty. It should be noted that while all of this cookware is part of the Emeril Lagasse brand, it's made by All-Clad for Emeril. Most All-Clad products are made in the United States, but the Emerilware line is made in China. The warranty covers defects that appear under normal use. If you're following the instructions for your pans and they develop a hot spot or start to warp, your warranty should cover the replacement. A word about the glass lids: glass lid damage or failure is not covered. Like everything else, glass contracts and expands when it's exposed to temperature extremes. Unfortunately, a hot spot on a glass lid next to a cold spot has nowhere to expand to. The glass can shatter under this pressure. Review the instructions with your cookware to confirm you're using your glass lids safely. The Emeril Lagasse line of kitchen tools and restaurant brand are about much more than food. Lagasse owns multiple restaurants across the United States and promotes a line of durable kitchen gear made by companies known internationally for quality and durability. If we had to choose just one Emeril cookware product, it would be the Emeril’s Nonstick Cookware set. More often than not, we need to replace our current pots and pans, and this dishwasher-safe set offers the most commonly used items. If avoiding products made in China is important to you, Emerilware is probably not your best choice. Instead, check out All-Clad cookware made in the USA.